All machines, accessories, and books can be sent Free Matter through the USPS. The Talking Book program provides patrons who are unable to read standard print materials because of a visual, physical, or reading disability free access to talking books and magazines. 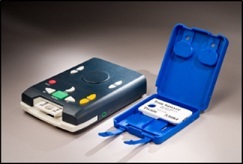 The Talking Books program is administered by the National Library Service for the Blind and Physically Handicapped (NLS), a division of the Library of Congress. The books on cartridge, machines, and all accessories, including headphones and pillow speakers, are distributed by the ND State Library in Bismarck. All materials are free of charge for those who qualify, including postage for receiving and returning the equipment. Downloadable e-books and magazines are available through the Braille and Audio Reading Download, or BARD, website. Applications to register for the Talking Book program are available from the VRC. For more information, contact the Talking Books office at the ND State Library in Bismarck, 701-328-1408. Above: A Talking Book machine and cartridge with case.